I currently organise workshops several times a year and they take place in Dorking, Surrey. They’re always fun, inspirational and educational! Beginners and advanced post grade 8 players all welcome. I tailor-make each workshop to ensure that everyone is comfortable, happy and challenged. 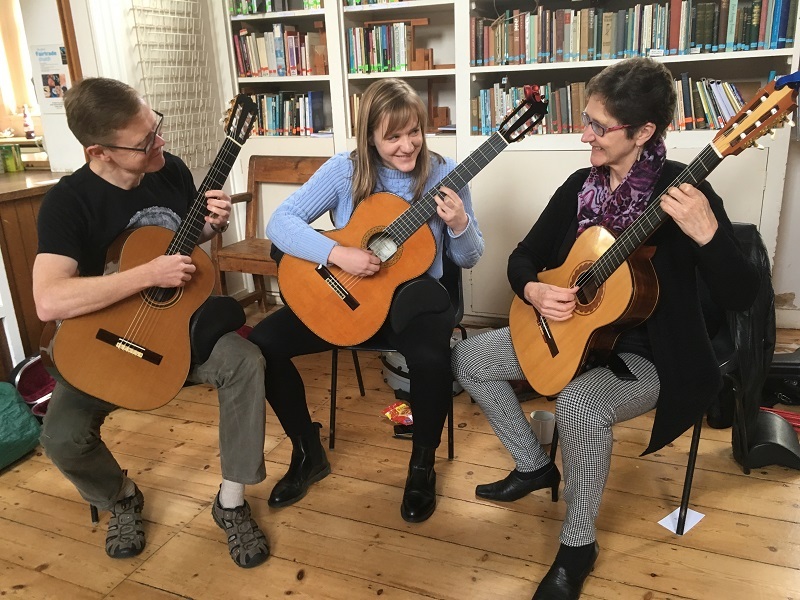 Typically, if you attend several workshops a year, you will experience an opportunity to hear and play solos, rehearse in trios and quartets, participate in a large guitar ensemble, increase your musical knowledge and meet like-minded souls. Occasionally, I invite a guest speakers to join us. If your guitar society would like a workshop presentation, please feel free to contact me using the form below and we can work out a tailor-made session to suit the needs of your members. “Thanks for yet another enjoyable and inspiring workshop! In June 2017 Jonathan Preiss led an engaging, high energy Brazilian workshop. Fast paced, packed with energy. Guitars, cavaquinho, seven string guitar and a vast array of percussion instruments. He used a simple layering of rhythms and textures ending in complex results, immersing us in Lundu, Polca, Maxixe and Choros. The guest speaker for the April 2016 guitar workshop was the fabulous Melanie Spanswick (pianist). She gave a brilliant workshop about sight-reading and memorisation and everyone took away a lot of ideas. Coupled with my talk on fretboard knowledge and strategies to learn the fretboard more thoroughly, everyone felt more comfortable with the prospect of sight-reading by the end! Hugely enjoyable. I invited Clare Cullen from the Ashtead Chiropractic Clinic, Surrey, to deliver a presentation at the latest guitar workshop in Dorking, June 2016. She spoke about posture, muscle use and the skeletal system and she highlighted what guitar players need to watch out for when practising or performing in order to keep the body healthy and functioning properly. The sensational flamenco artist, Francisco Antonio took us through rasguedos, the 12 beat compass and Alegrias. A start to the de-mystification of this Spanish Art. The brilliant Peter Stewart, teacher at The Royal Conservatoire of Scotland, gave us a talk on tone production and nail care. 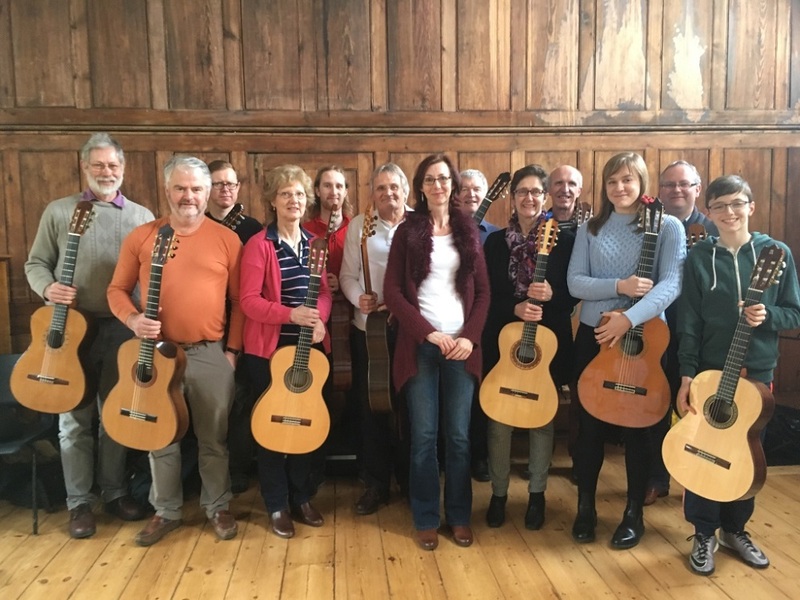 Ending 2015 with a swing, my Dorking guitar workshop centred on popular music arrangements for classical guitar. Having heard glorious singing to “What a Wonderful World!” in Louis Armstrong fashion, I had it humming around my head for days after! Other highlights for me were a Russian song beautifully sung with guitar accompaniment and a simple yet extremely effective Bob Dylan arrangement of “Blowin’ in the Wind”.